The OCN Channel makes the best Korean crime thrillers, that's their specialty. 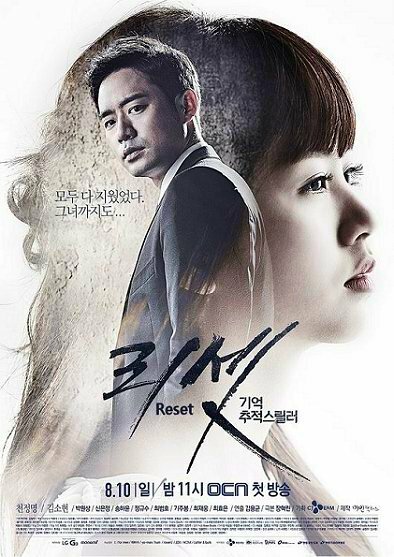 Unfortunately this one, Reset (2014), just didn't grab me the way I expected, mostly due to the fragmented writing which was sometimes hard to follow, and the rather odd casting, which included my favorite young teen actress Kim So Hyun, and an actor I "met" for the first time watching the 2007 Korean horror film Hansel and Gretel, and later watched again in Cinderella's Sister (2010), Chun Jung Myun. I suspected this would be a bizarre show, and I was right. So far my favorite OCN crime thriller has been masterpiece Missing Noir M (2015). Chun Jung Myun has his own intense, unique look, different from many other top Korean actors, which makes him a good choice for darker stories. However, because the age gap was so wide in this drama (Kim So Hyun was 14 when she made this, and Chun Jung Myun was 34), I know it made some folks uncomfortable seeing this match-up, albeit a platonic one in the actual story; images advertised with them clinging to each other like this didn't help matters and didn't really reflect the story that they created. 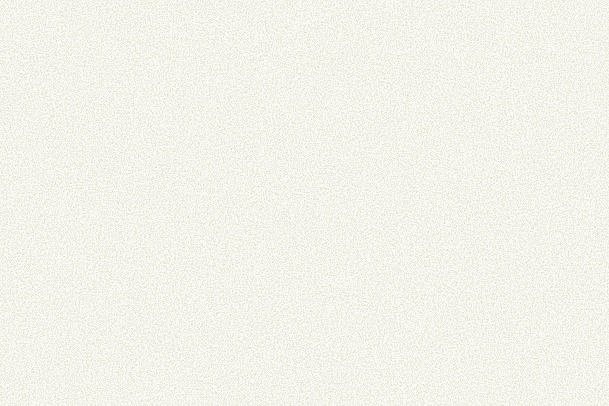 I'm a Mom of five and have always believed in keeping kids innocent for as long as possible. To be fair, this drama never showed even a kiss between them; the driving focus was elsewhere, and in flashback scenes a younger actor was used to pair up with Miss Kim, named Choi Soo Han, who represented the younger version of Chun Jung Myun's adult character in the story. However, I do think Kim So Hyun fans should watch this drama, even though the writing could have been better, simply because she plays dual roles of two very different characters and she really shines in playing them both. I shudder to think how much more lame this story would have been without her effervescence. Prosecutor Cha Woo Jin (Chun Jung Myun) often takes time off from work during prolonged lunch breaks to visit a psychiatrist for his recurring nightmares of losing his first love Seung Hee (Kim So Hyun) fifteen years earlier to murder. She was a sweet innocent thing and he could never forget her. He has spent his life focusing on crime investigations as a prosecutor, with the aim of someday discovering who the person was who took her life. Especially as the story begins, he feels an urgency to work even harder on the cold case because the statute of limitations is running out soon and the murderer would be unable to be charged for the crime. 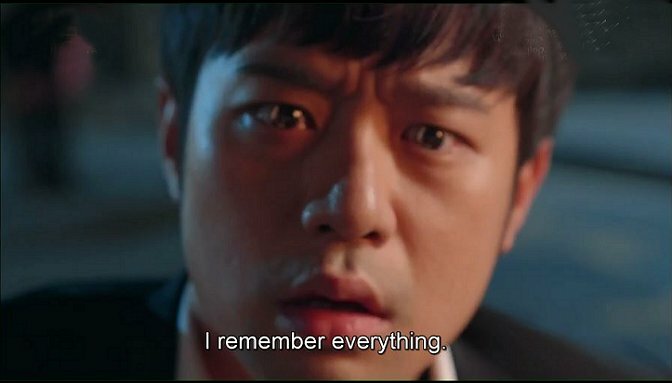 Woo Jin is even willing to try self-hypnosis to help determine if there were memories he suppressed at the time of Seung Hee's murder, and eventually he uncovers some in his psyche. While working on a current case Woo Jin then suddenly meets on the street a tough and sassy high school girl, Jo Eun Bi (Kim So Hyun again), who looks exactly like his first love, except for the smirk on her face instead of an innocent smile. Could this be a coincidence only? Their surprise meeting shocks Woo Jin and eventually unleashes secrets and a chain of events between Cha Woo Jin, Seung Hee, and Jo Eun Bi, as well as the suspected criminal who took Seung Hee's life. During the process of Woo Jin and Eun Bi getting to know one another the direction of Eun Bi's life changes drastically. Without his influence her path would have inevitably been the street. With her help they uncover the murderer's identity by the end of the show. There are some quite effective CGI techniques used in dream sequences, like monsters crashing through large office windows, and having Kim So Hyun appearing like an angel as Seung Hee in the spirit world. It seems Seung Hee herself wants Woo Jin to solve her murder and bring the criminal to justice and she doesn't want him to rest in his pursuit of that person. Her spirit is unhappy and unfulfilled. Reset is not exactly an original idea for a show, but the screen confidence and versatility of the two main actors makes it worth watching. I'll watch Kim So Hyun in anything at this point. She is on her way to becoming Korea's premiere actress, as the ones we watch today move into their late 30's, early 40's and are forced to stop playing ingenue roles and move on to play mothers and career women. Enjoy.